Awake at 8am and we are approaching the beautiful island of Mykonos. 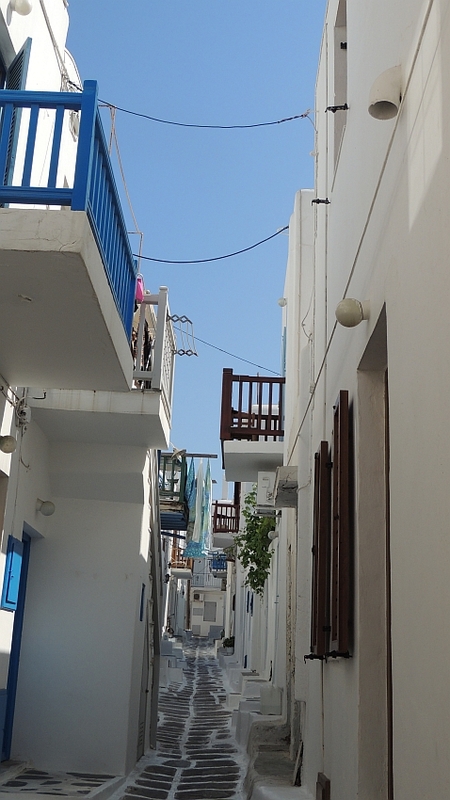 Tiny white houses dotted around the island and the green landscape give us a glimpse of whats to come. 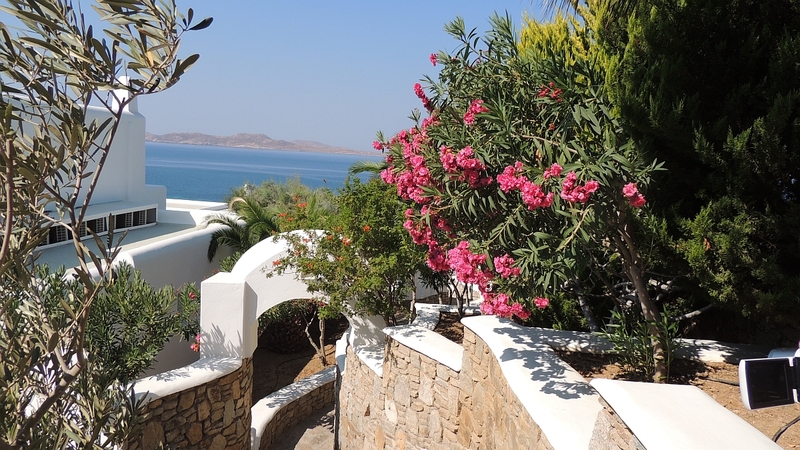 We are lucky again in that we have a wonderful view from our balcony and can see out to the famous windmills in Mykonos Town itself. We sit outside the Oceanview Café for breakfast and enjoy the view whilst I have a muffin, smoked salmon and scrambled eggs and Kev enjoys a freshly made cheese, ham and tomato omelette all served with fresh orange juice and coffee. At about 9.45am we disembark and at 10am dead on time a mini bus arrives to take us to St. Johns Resort. The driver waits 10 minutes, but as no one else arrives he leaves and we drive over the island to the hotel. We booked a day pass for this having read great reviews  we figured it would be good to have a nice relaxing day after yesterdays sightseeing trip in the heat. The cost was 30 euros each, which included pick up and drop off and use of the resorts facilities. The resort is staggered on the hillside with a beautiful pool area with infinity pool, dining room bar, spa, and then its own small beach. We check in and are given a map and directed down to the pool area. We have a relax on a lovely suspended day bed near the infinity pool and enjoy the sunshine and the cooling water. At 1pm we go to the snack bar and have a delicious lamb kebab with salad and tzatki in toasted pita wrap with chips and a chicken Caesar salad  which we split. This is accompanied by two very large and very cold beers and comes to 40. We were suitably impressed by the large portions and enjoyed lunch very much. 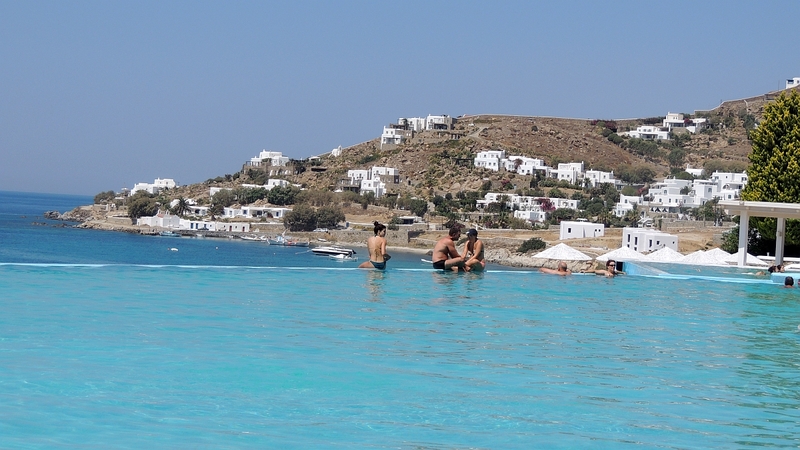 After relaxing and enjoying a swim in the pool it is soon 3.30pm and the time we had previously decided to leave to give us enough time to explore Mykonos town before the ship leaves. 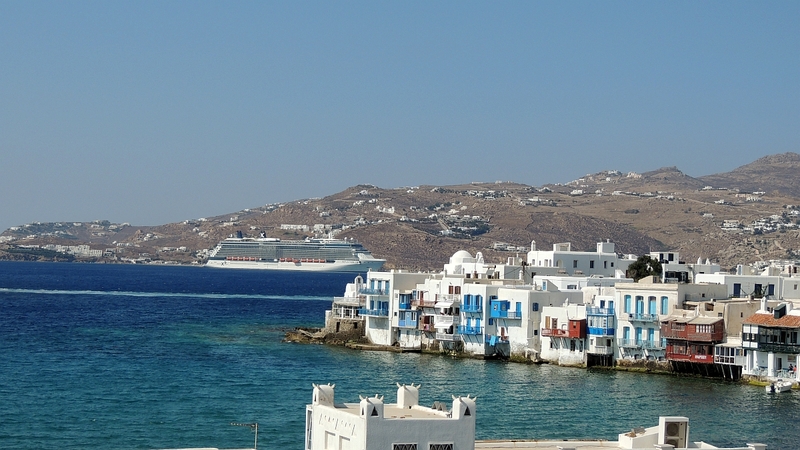 We go to reception and request transport back to Mykonos town. We share a shuttle bus back with some American tourists who seem very worried that they wont be able to get back to the ship in time if they get dropped in town so once we get off near the windmills they are taken back to the ship. 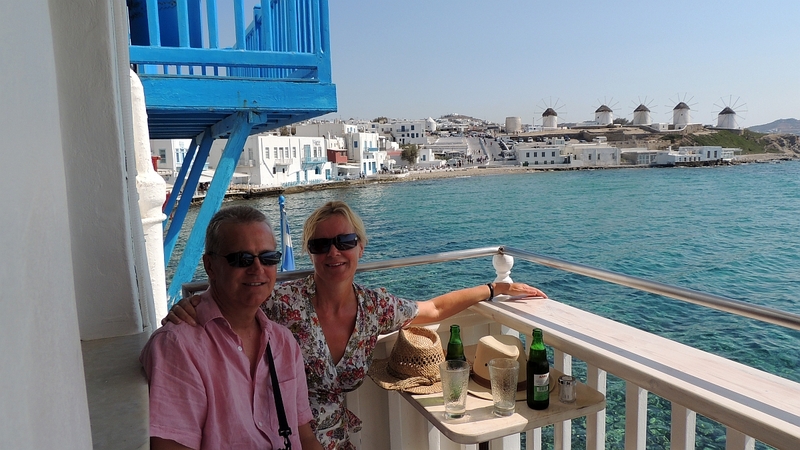 What a treat they missed  Mykonos town is a delight  narrow cobbled streets, whitewashed houses, shops, bars and restaurants but in a typical greek style. 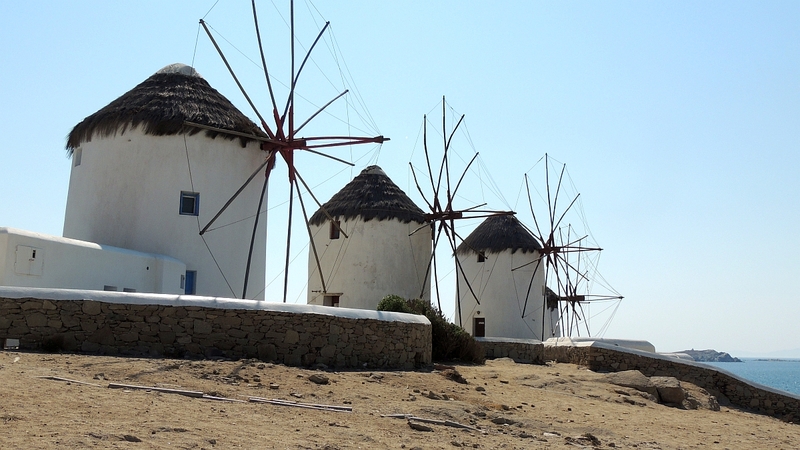 We head straight to the windmills to take pictures of what must be the most iconic image from this island and then wander back through the streets until we find Katerinas Bar which is situated on the waterfront in the Little Venice area. 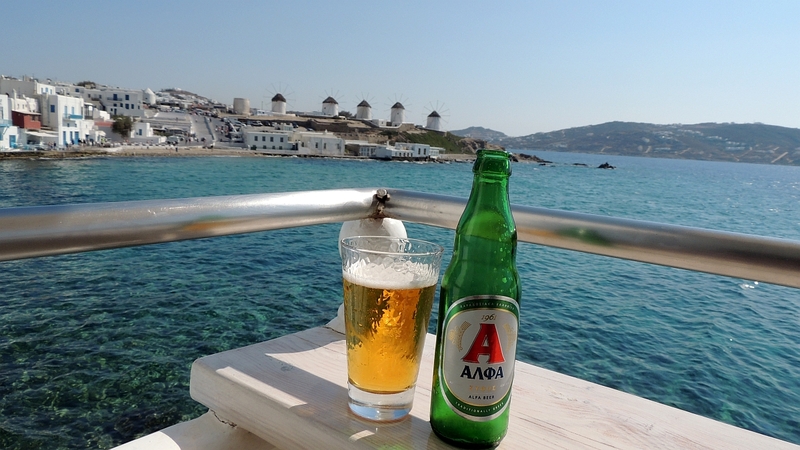 We had read great reviews for this bar and werent disappointed as we found a small table on the outside balcony with a view down to the clear blue sea and the row of windmills in the distance. 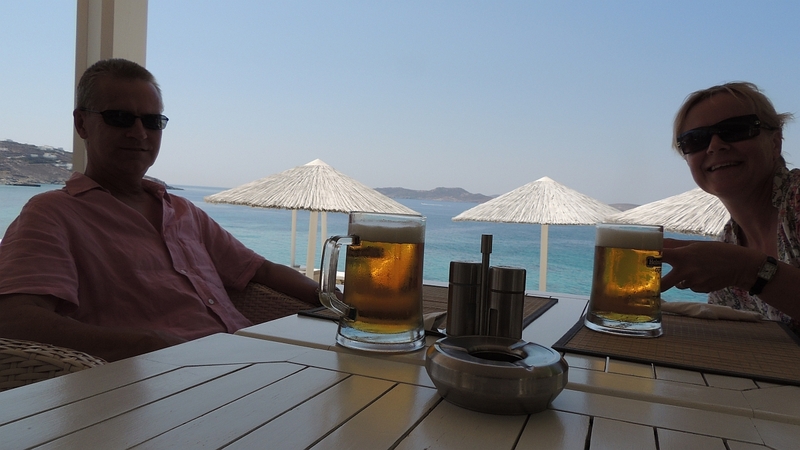 A cold Greek beer slipped down very nicely and it was a lovely way to end such a relaxing day on this beautiful island. As we hadnt bought a shuttle ticket from the boat we decide to walk back to the boat that we can see in the distance  in hindsight whilst it was easily walkable and took us 45 minutes  it was quite a trek and in the baking heat and with the traffic whizzing by us were not sure we would walk back again. 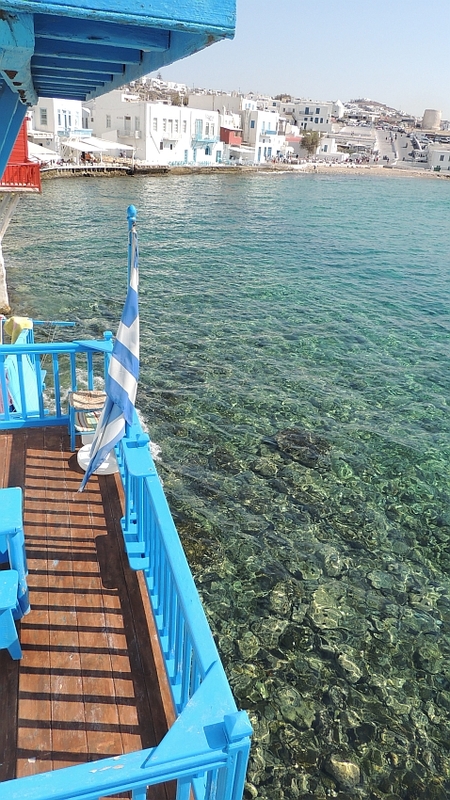 The cold towels and cold drinks in the port were very much needed after that walk and we go straight to the cabin to shower and change before sail away. 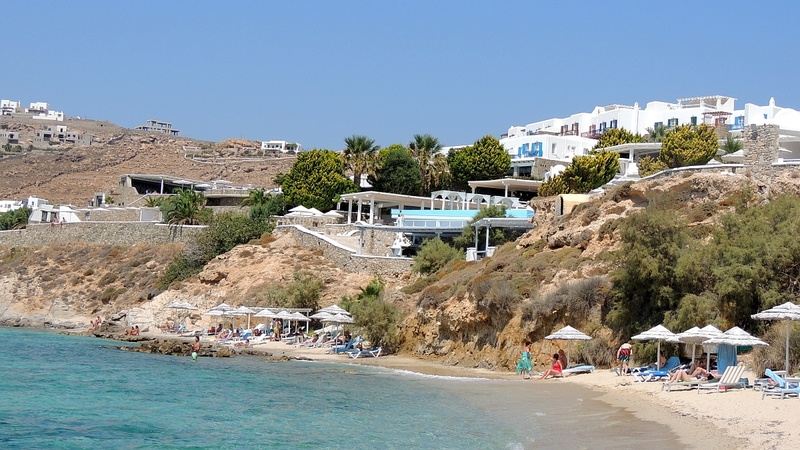 Sit by the side of the lawn club and enjoy a margarita as we sail elegantly away from Mykonos. 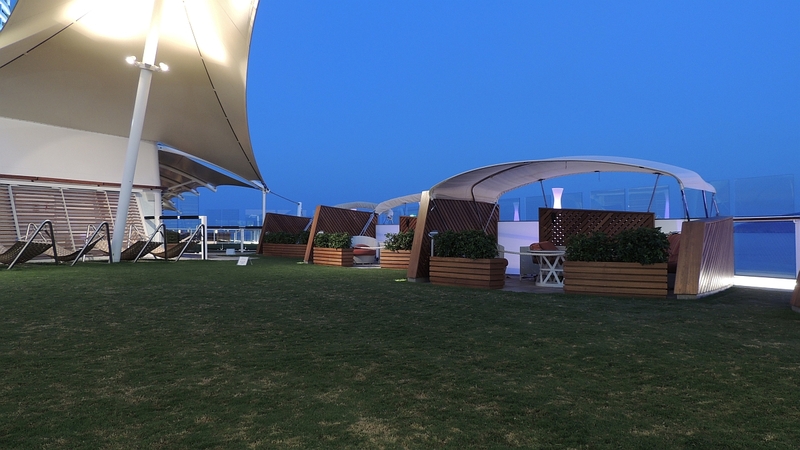 We have reservations for the Lawn Club Grill tonight  another first for us. To start with you help yourself from the large assorted salad bar with a choice of dressings then we have a flatbread to share  we choose a BBQ chicken with various other toppings. The thing with the Lawn Club Grill is you are invited to make your own flatbreads and pizzas if you want which looked a lot of fun but we decided against it this time. The pizza was very good and very tasty but we were trying to keep room for the grilled meat selection, which came next. There was a lot of choice here again and we decide to have a rib eye steak each and share lamb chops and a shrimp and scallop skewer. 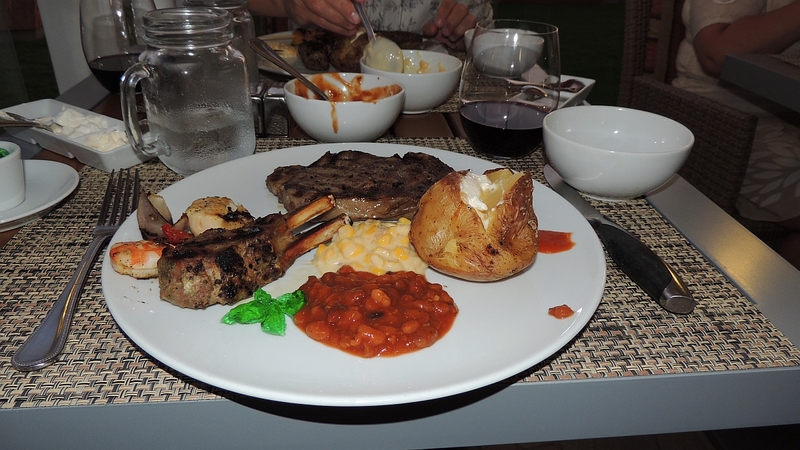 These were accompanied by lots of sides including jacket potatoes, the best creamed corn I have ever tasted and speciality barbecue beans, which in contrast were not good at all. An assortment of sauces to accompany the meat was also bought to the table and there was chimi churri and barbecue amongst others. 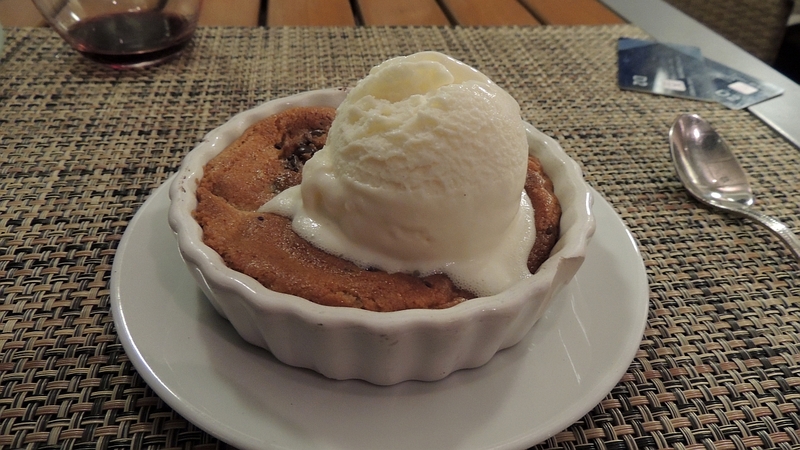 Luckily I had a bit of room left and chose the warm cookie pudding that was recommended  this was to die for  a dish with a soft baked large choc chip cookie accompanied by a large dollop of ice cream. Wow what a fantastic end to the meal. Suitably satisfied we have an early night as all that fresh air and relaxing has made us very sleepy.